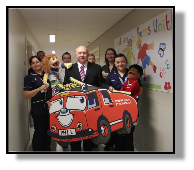 Whilst it is hoped that children will learn the fire safety message before they become hurt, unfortunately there are a number of children who are injured by fire on a daily basis. 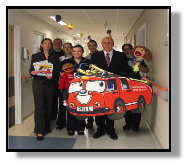 The staff at the burns unit of Greater Manchester Children’s Hospital know this only too well and work tirelessly to help these children make a full recovery. However, as well as making a full physical recovery, their is a need to help educate the children about fire safety to ensure they don’t hurt themselves again in the future. 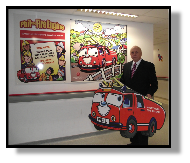 In conjunction with Pannone Solicitors and the Greater Manchester Fire Brigade, Phil the Fire Engine books have been donated to the Burns Unit to help get this message across. 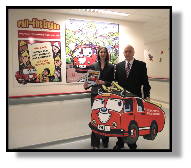 In recognition of this new partnership, the Hospital have unveiled a new Phil the Fire Engine mural at the Burns Unit. 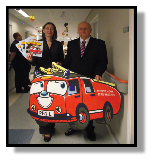 See the pictures on this page to find out more.